Master personal trainer and former champion bodybuilder Fairfax Hackley, right, has been named the United States Sports Academy’s 2017 Dwight David Eisenhower Fitness Award winner. 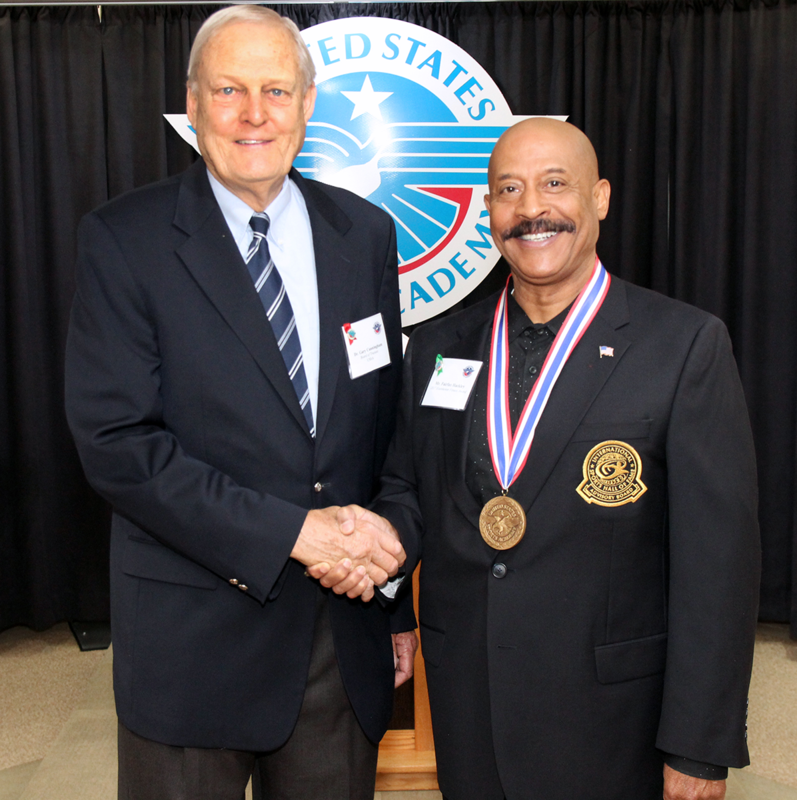 Hackley was presented the honor by Academy trustee Dr. Gary Cunningham at the Academy’s 33rd Annual Awards of Sport celebration held recently on campus in Daphne, Ala.
DAPHNE, Ala. – Master personal trainer and champion bodybuilder Fairfax Hackley has been named the United States Sports Academy’s 2017 Dwight David Eisenhower Fitness Award winner. Hackley was recently presented the honor by Academy trustee Dr. Gary Cunningham of Santa Barbara, Calif., at the Academy’s 33rd Annual Awards of Sport celebration held on the Academy’s campus in Daphne, Ala.
Hackley spent more than 20 years in bodybuilding, winning the International Federation of Body Building and Fitness (IFBB) Silver and Gold Awards for Excellence in Administration. He won 12 class titles in the sport and later served as a judge and as director of the Mr. America contest. He has trained numerous celebrities and athletes, including boxers and mixed martial arts (MMA) fighters. He has worked closely with the Arnold (Schwarzenegger) Sports Festival in Columbus, Ohio, as director of arm wrestling and leading the MMA Workshop. The Dwight David Eisenhower Fitness Award is presented to a person who has shown outstanding individual or cumulative achievement in fitness and has contributed to the growth and development of sport fitness through outstanding leadership activity. As president, Eisenhower founded the President’s Youth Council on Sport and Fitness. This national committee served as the catalyst to the nation’s fitness movement. His work is evidenced today by the number of “physical fitness tests” being administered to the American youth. A resident of Falls Church, Va., Hackley was a multi-sport athlete throughout his youth and college who went on to compete in bodybuilding. He is a member of the International Sports Hall of Fame, serving on its advisory board. Hackley has been featured in USA Today, Muscle & Fitness, People Magazine, Washingtonian Magazine, the Washington Post and Flex. He has appeared on more than 200 television and radio segments. He gives weekly fitness tips on WTOP radio, a commercial radio station in the Washington, D.C., area. He also worked six years as the fitness coordinator for the United States Marshals Service in the Washington, D.C., district. Affectionately known as the “Sultan of Sweat,” Hackley is the owner of Body by Hack, a personal training company based in the Washington, D.C., area. The Dwight David Eisenhower Fitness Award is part of the Academy’s Awards of Sport, which each year honor a wide range of accomplishments in sport and serve as “A Tribute to the Artist and the Athlete,” in conjunction with the Academy’s American Sport Art Museum and Archives (ASAMA). The awards recognize these men and women through the Sport Artist of the Year, Honorary Doctorates, Medallion Series, Distinguished Service Awards, Outstanding Athletes, and Alumni of the Year awards.